Carboxymethyl cellulose (CMC) is a material I’ve written about before, that works as an oil and water emulsifier for use as a painting medium. 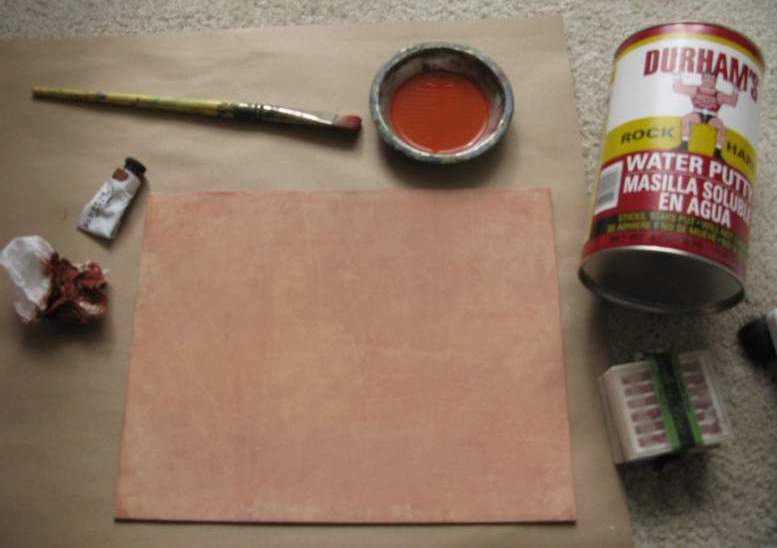 It has an adhesive quality that should also work as a fixative. I’m testing out a batch of it by comparing it to the homemade casein fixative I’ve been using for some time now. 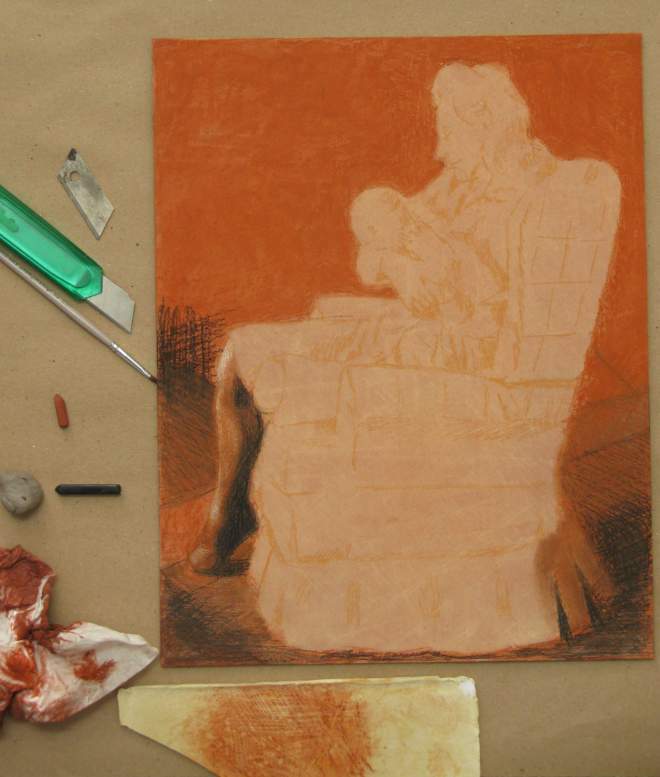 Fixative, if you’re not familiar, is a spray finish applied to dry media, such as charcoal, to keep it from smearing. First, the CMC powder was converted into a glue gel by adding 8 parts (tablespoons) water to 1 part powder. I let this sit for a few hours for the water to be completely absorbed and the lumps to disappear before using that to make a fixative solution. 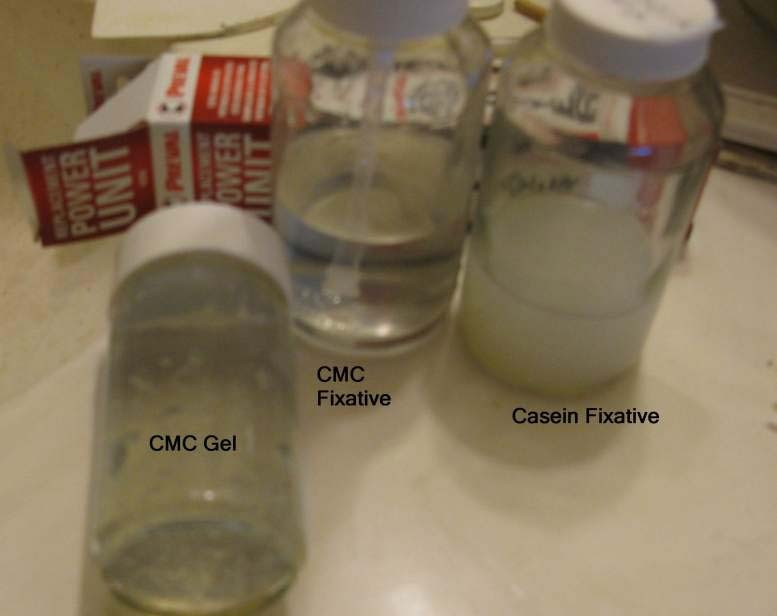 The proportions as I use for casein fixative is 1 part gel, 2 parts alcohol, and 5 parts distilled water, so I made the CMC version with the same proportions. It seemed to be a little thicker than the casein, but still sprayed okay with the Preval sprayer. 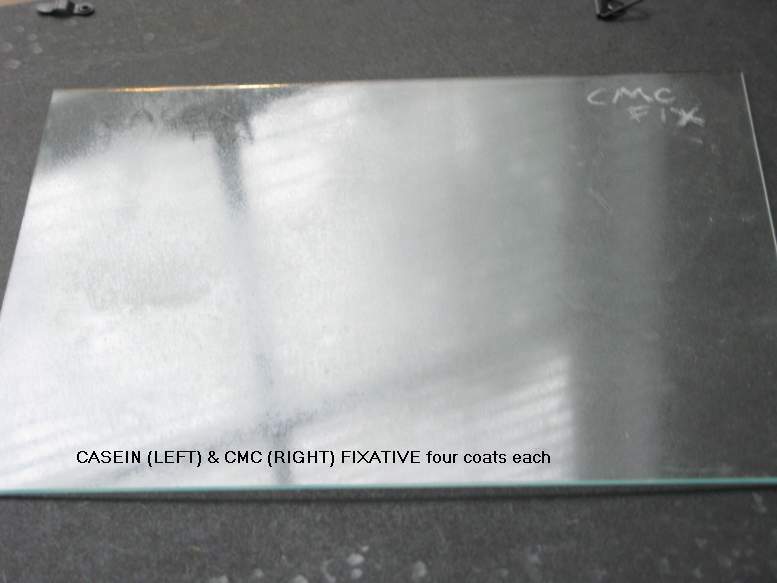 You can see in the first photo above that the CMC is clearer than the casein fixative, but both look the same when sprayed on a sheet of glass. I took a small sheet of grey cardboard for my smear test, and drew some dry media marks on both sides using a soft pastel, charcoal, an 8B pencil, and white chalk. On the left the marks were not fixed, and on the right I sprayed three coats of the CMC fixative. Holding the cardboard up to the light you can see a slight darkening of the paper from the CMC. It has a very slight satin sheen, but is mostly matte and clear. I also smeared the marks on the left to demonstrate the difference. After wiping the fixed side with some pressure using a paper towel I got no transfer at all from any of the marks on the right. I would call the test a success! Even the chalk seemed to hold up very well without darkening in value. CMC appears to work just as well as casein for a homemade fixative, but more time will be needed to see if it holds up as well. I’m encouraged by this test. For now, I’ll likely continue making casein fixative, since I have some stock of it to use up. That brings up the major point in the difference between the two: shelf life. CMC powder can be stored indefinitely in a drawer, while casein has a limited shelf life, even as a dry powder. CMC is organic matter and can also grow mold when made into a gel, so I’ve added a drop of tymol as a preservative, not required if you make small batches or use it up quickly. 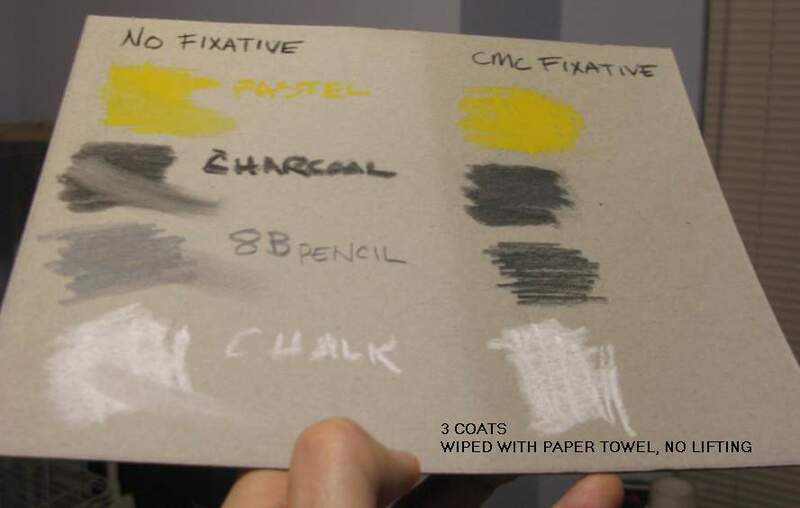 As with casein fixative, the CMC can be drawn over, but you don’t want the total layers to get too thick; four or possibly five coats at the most. Here’s where I stop on the drawing for now. It will need a little cleaning up, and I haven’t decided what to do with that dark void on the upper left. The water putty surface worked out well for this media. I wish I had made it a little smoother with how this drawing went along, but it came out okay. A box cutter knife turned out to be my best tool for scratching lines, and I discovered dragging it slowly gave me the best results. It was an interesting exercise. I also picked up some Prismacolor NuPastel earth tones, and Conte pastel pencils to help me get sharper marks. More of the drawing has been laid down. I’ve filled in the chair, and have much of the figures drawn in. It’s a slow process with layers made by lightly drawing in an area, blending that, scratching some, and drawing in again, scratching, etc. This builds up texture that I can’t get any other way. I’m back to working on the drawing. I got a little sidetracked when I wanted to test out a new idea for a fixative, and will show the results of that later. 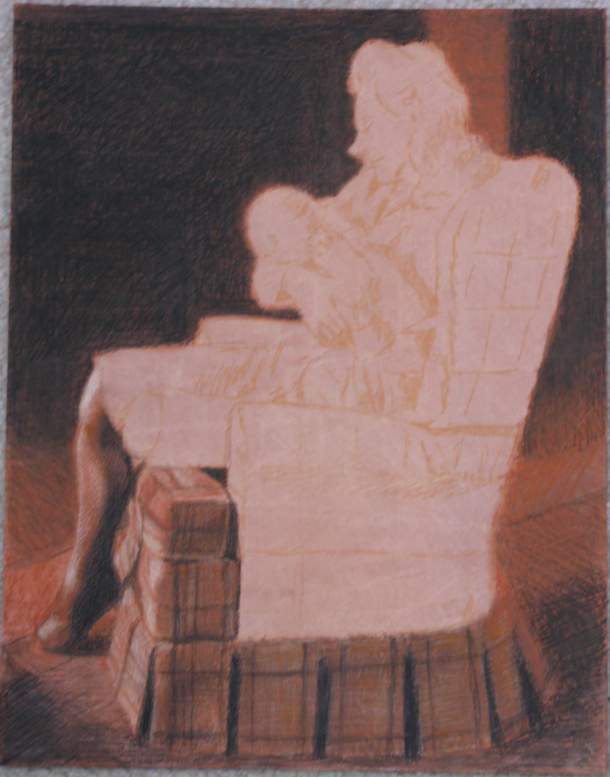 Here, I’ve gotten the dark background drawn in, and started on the chair. I’ve discovered that conte probably wasn’t the best choice for this plaster panel, since the surface is so soft that the hard conte easily scratches into it. It will work, but I had to be careful with my drawing pressure, which slows me down. I decided to help things out by going back over some areas with soft pastels, and that was an improvement. I’m not sure about leaving that open dark area, and may add some furniture or some such later. Making some progress with the new drawing on the Water Putty panel. I spent time testing out how the conte would work on this surface using some broken scrap pieces, as well as trying different tools and effects. I wanted to be able to scratch away some lines, and saw that sharp metal worked best. I tried hard plastic and wood, but they did little more than push the pigment around. Water also didn’t work as I expected. I thought it would displace the pigment more, but it only sat there, as though the conte was repelling it, similar to what happens with graphite. A small, dry, stiff brush seemed to be the best tool for getting a smooth blend. As I’ve discovered in the past when scratching ink on a similar type of surface, the scratch lines tend to work in some directions better than others, which takes some getting used to. I feel I’m getting the hang of it, though. Too much relaxing lately, so it’s time to get back to making some art. I’m starting a new drawing here, and will again be using conte crayons. I was visiting with a carpenter friend over the holiday, and he showed me this stuff called Durham’s “water putty” that’s a sort of mix between plaster and wood putty. I mixed it up per instructions, and coated a small wood panel (11 x 14″) with it. I also wanted it a little rough for some extra texture, so I didn’t brush it on too smooth or sand it down. After drying for a couple days, it turned a slight shade of pale yellow, so I decided to coat it with a casein wash of some red oxide paint I had made some time ago. Even though the paint was very thin, it was still too dark on the panel, so I wiped it down with a paper towel. 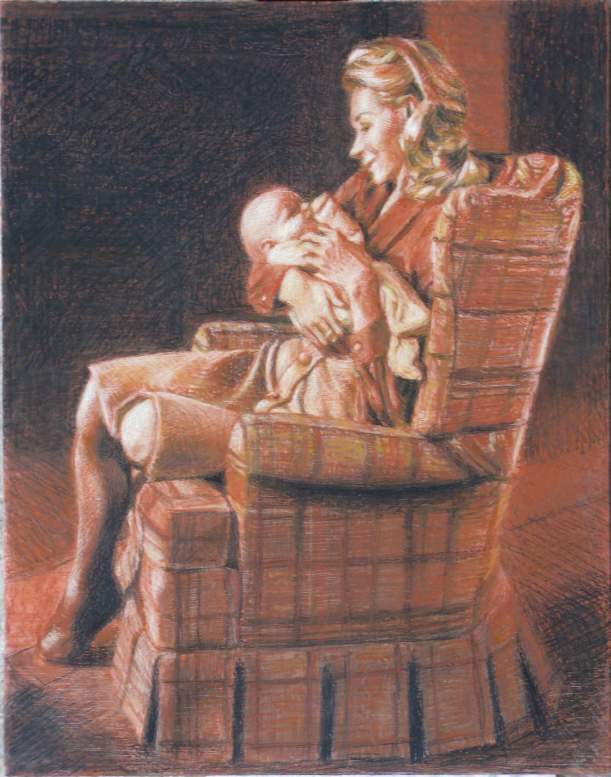 The drawing I wanted to use was an old sketch I had made of my friend Patricia with her daughter Elizabeth. 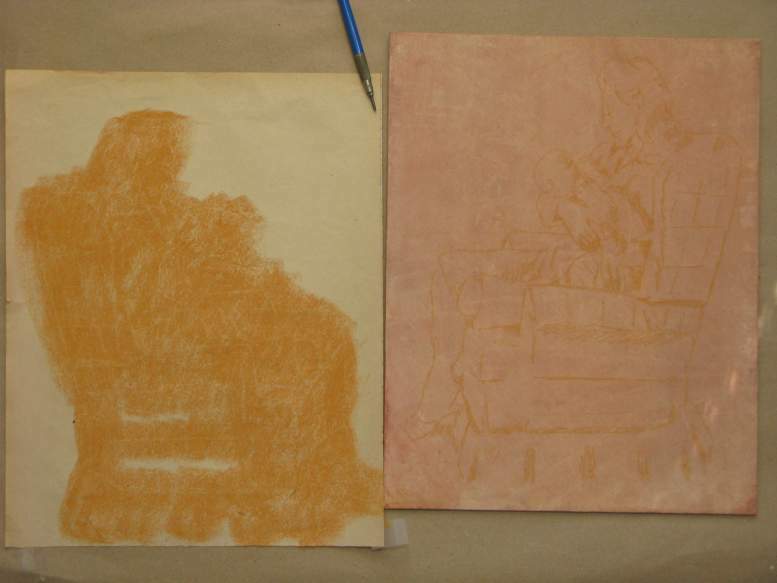 I took a soft pastel that had a color value similar to the panel, but slightly darker, and rubbed it on the back of the sketch to transfer it to the panel. I discovered that I can lightly scratch through on the panel to get fine lines to the lighter value under the paint, or also wipe off the paint with a wet brush, so that will let me draw in darker shades, and remove it for lighter highlights, or so is the plan. I’ll start the drawing soon, and show you the results later. Picture yourself having just watched a film or TV show, and at the ending credits some names you might expect to see are missing. Perhaps it was an animated cartoon, and there are no names of the artists who made it. There was a time not too long ago where that was common practice. You can thank unions for correcting that. For those of you that play video games, do you ever take time to look at the credits? It’s rare to find all the names of those responsible for making the art that you just enjoyed. For magazine and book illustrators in particular, this practice has gone on for over a hundred years, and still does today. I’ve never quite understood why, but have guessed that for some reason their work is treated by the producers and directors as less significant content, like the outer packaging that people will discard to get to the real gift inside. The writers and producers will always get their due, but rarely will the artists. Check on eBay for thousands of sellers who have cut out the art from a magazine to resell, without mentioning who actually made it, likely because they have no idea. I’ve been a huge fan of illustration art of the 20th Century, collecting original paper copies whenever possible, and have spent the last couple decades digging through the internet trying to uncover more examples of this art form, and learn about the people who created it. 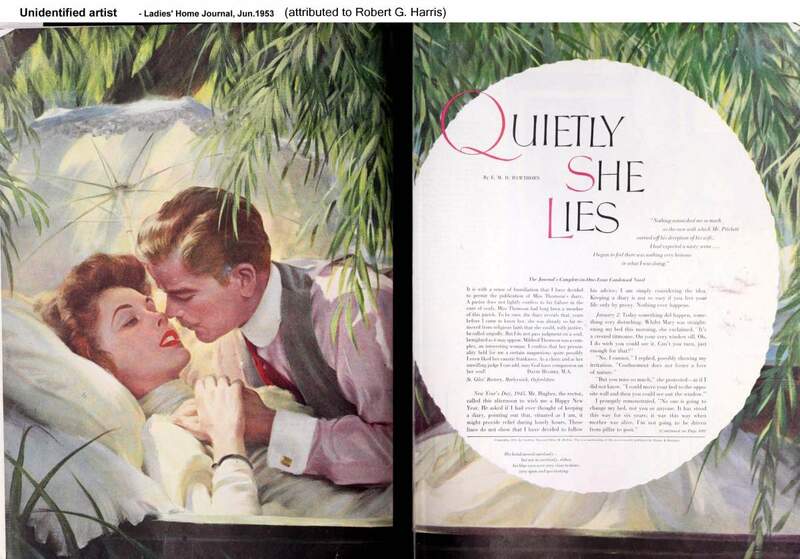 Major magazines and most illustrated books gave the artist’s name in small print, but not always, and almost never in advertising. In magazines, sometimes the names might be buried in a credit section at the front, as with Life or The Saturday Evening Post. Many times, especially with advertising art, the only credit is with a signature. On the printed page it might be so small you’d need a magnifying glass to read it. 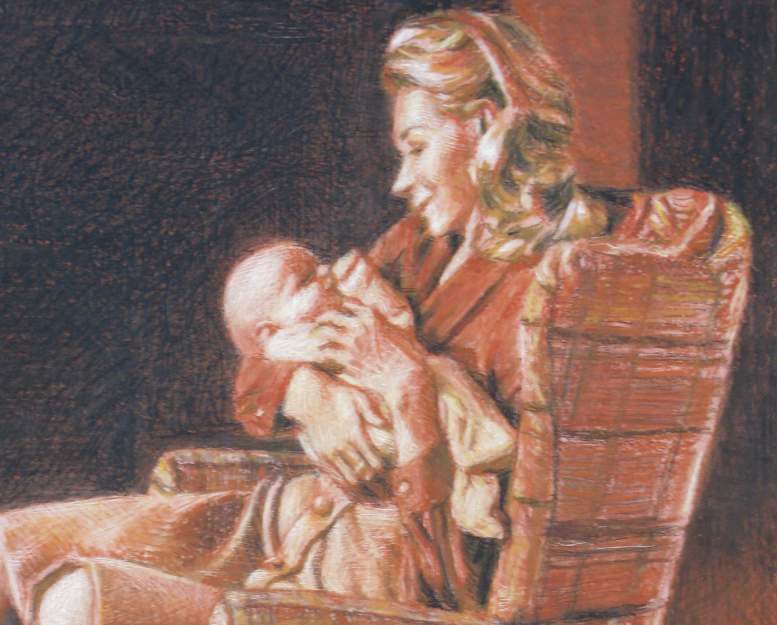 On the net, small low res scans make it also very hard to read, or whoever scanned it cropped it off as unnecessary. The artists themselves didn’t often help matters by making their signatures illegible, or use only their initials or a unique symbol instead of their name. 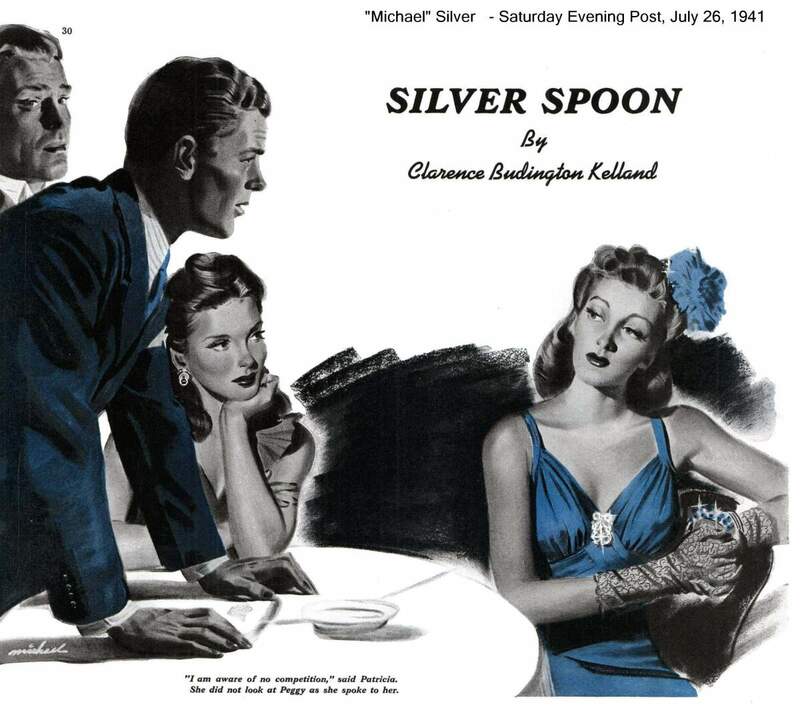 Some artists complicated things more by only signing with their first name, as with Michael Silver or Lucia Larner. 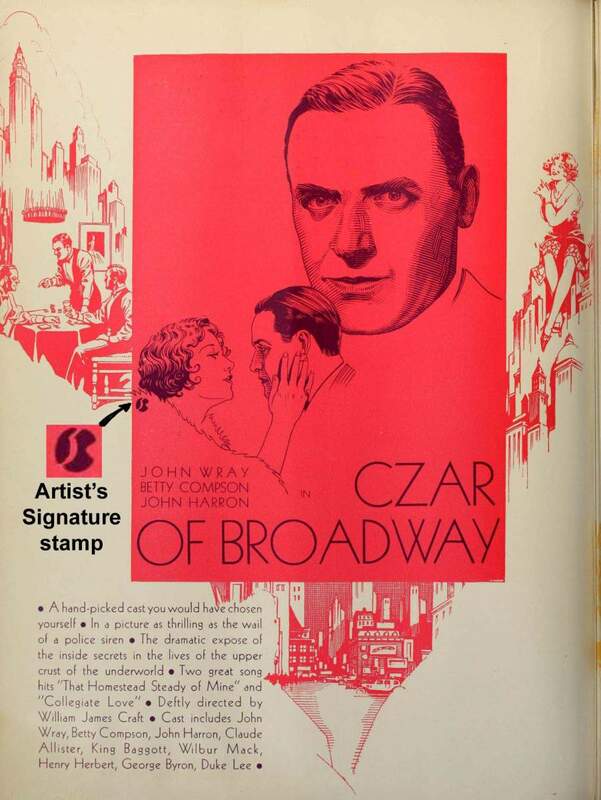 Sometimes the signature of just the last name can be very clear, but the name is a common one like “McCarthy,” making it very difficult to nail down. 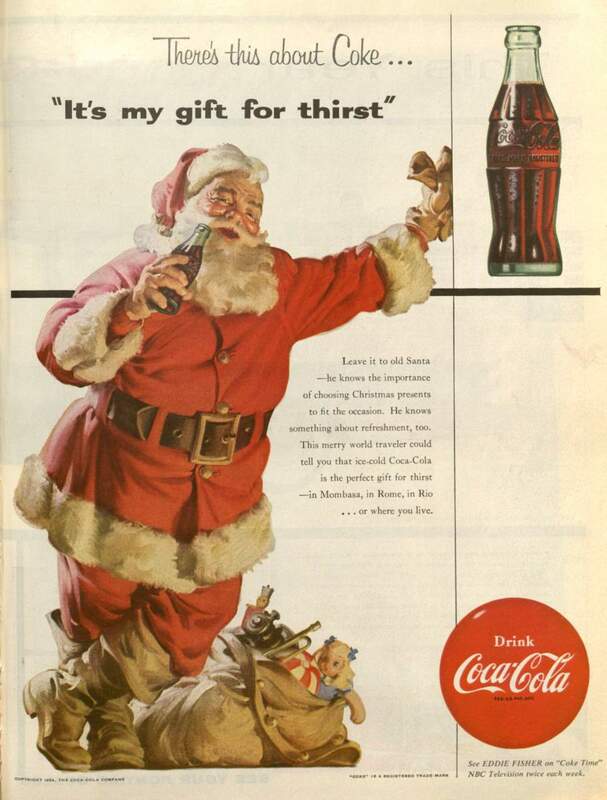 The artist Haddon Sunblom created a now iconic “Santa Claus” for Coca-Cola, and many of his pieces are unsigned, despite having a very similar style of painting, so one might think all Coke Santas are by Sundblom. Not true. He had a staff of artists working for him that would copy his style so he could keep up with all his projects. 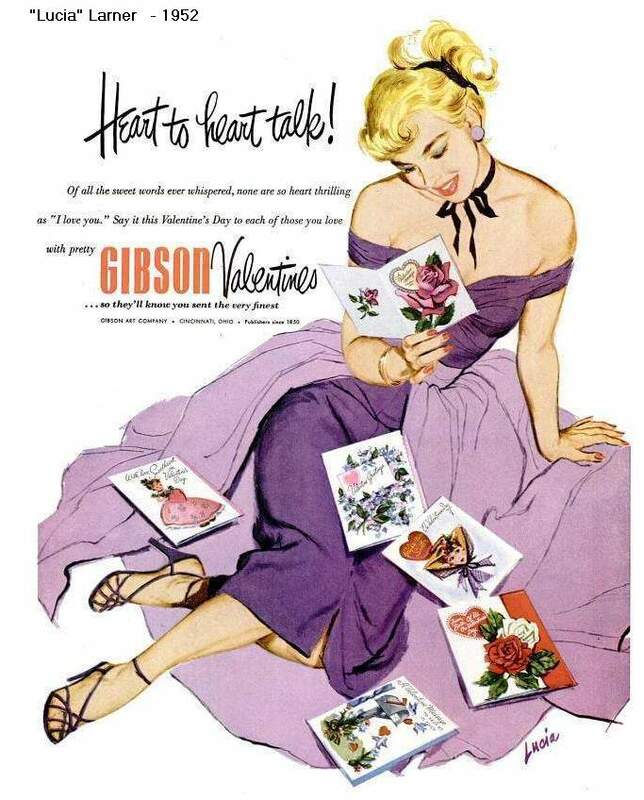 Gil Elvgren was one of them, and he went on in his solo career to establish himself as a popular pin-up artist. Thankfully, I’ve been able to network with other like-minded fans of this art form to help me identify the names of these artists who might otherwise be forgotten to the shelves of the past. One such excellent resource has been the website called “Today’s Inspiration,” run by Leif Peng. He also has a wonderful page on Facebook by the same name that I believe has the best collection of images for artists of the early to mid-20th Century. If you’re a Facebook member, please search for it. 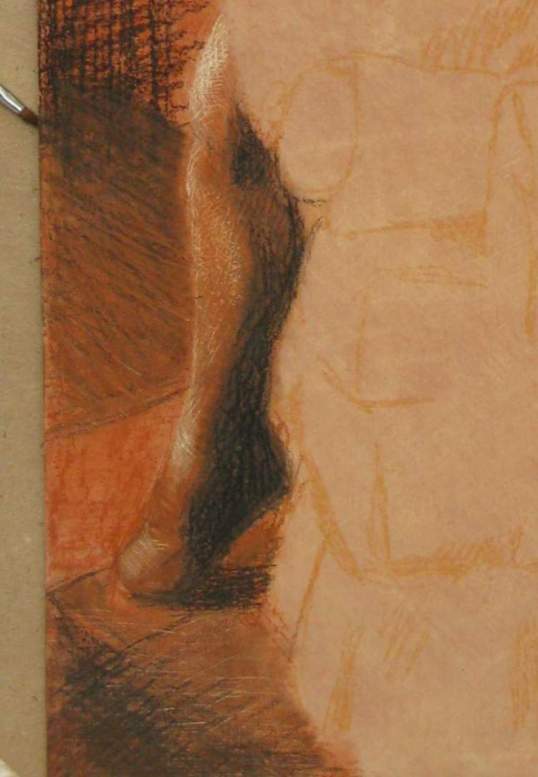 “American Art Archives,” run by Thomas Clement, is another good resource. 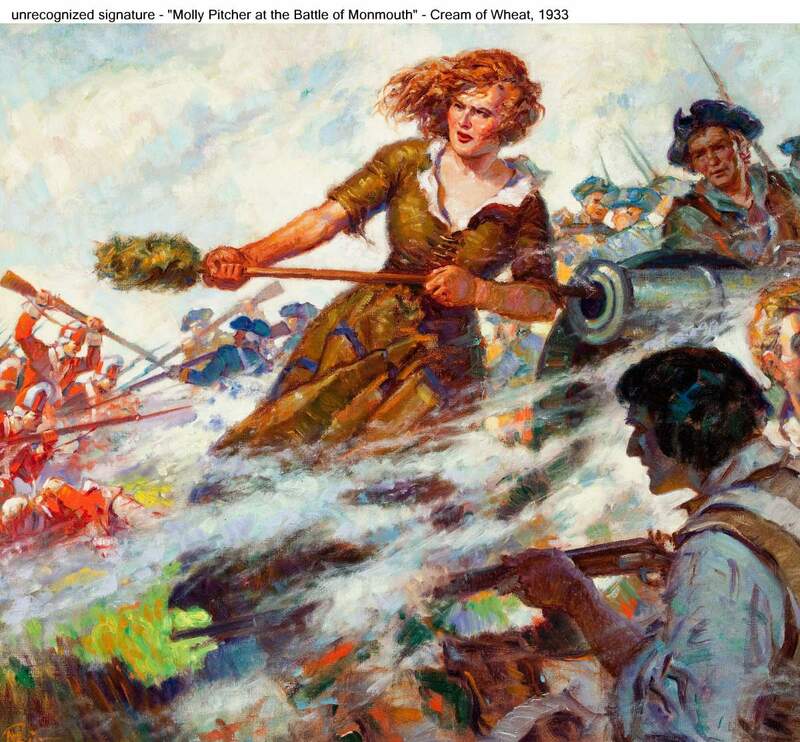 The Internet Archive, although not particularly well organized, is an excellent place to find scans of the books and magazines, and occasional reference material, if you know who you’re looking for first. J. Kingston Pierce’s “Killer Covers” is a good resource for paperback artists. 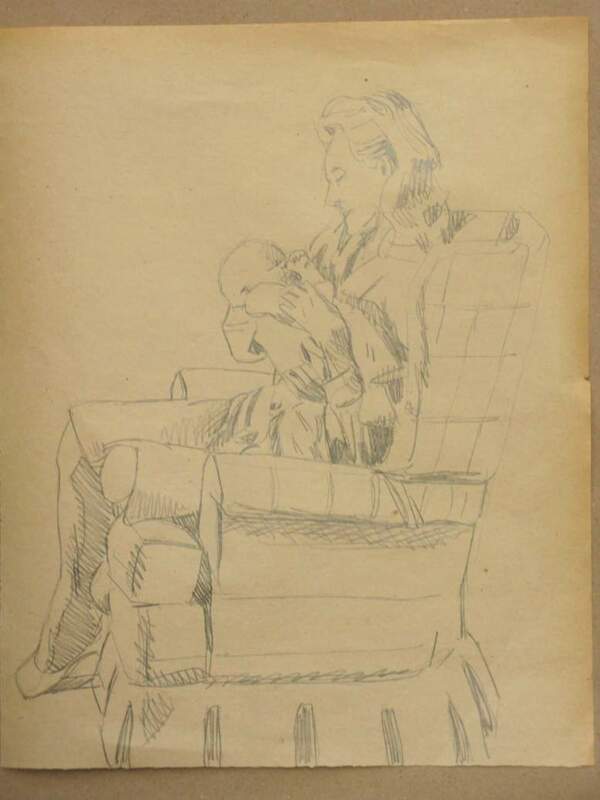 Auction houses, like Heritage, are good places to find scans of original art with credits, even though the names aren’t always correct. It’s a shame that many of these wonderful artists, even those whose works are properly credited, have mostly disappeared from memory. Many of them stopped working several decades ago, and they and people who worked with them are no longer alive. 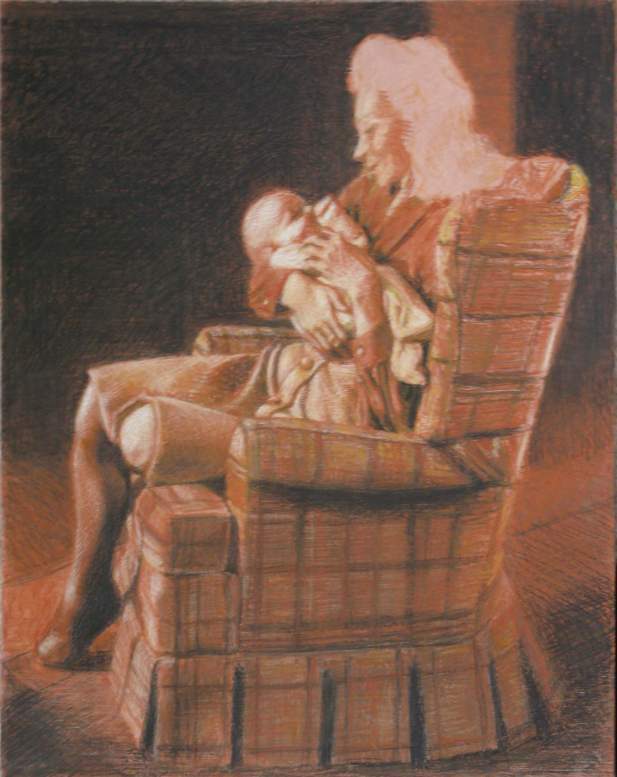 To this day, I have found printed examples by well-known artists, like Norman Rockwell, that even scholars of his work will say they’ve never seen before. There was a time when thousands of subscribers saw it on a weekly basis. Here’s hoping that someday soon they all get their due credit and admiration, and whatever nonsensical reason that still keeps such work hidden will disappear.